Please feel free to visit our school anytime. We welcome you to visit whenever it’s most convenient for you. To schedule an interview and complimentary trial lesson, please call, email, or visit the school. 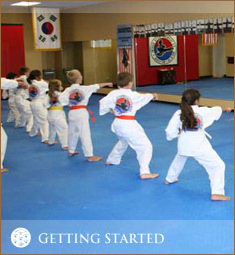 We have Beginner and Advanced classes for both Children and Adults. Free trial lessons (private or group), and private interviews with Sabom nim (Grandmaster Kim) always available. In addition, before you call or visit, please check the list below and discuss with us your specific reasons of interest. It is important for the instructor to know your goals, so we can fit you or your child to an instructor’s designated program and guide you through classes. This will allow for more positive overall results. What are the goals you hope to achieve from Martial Arts training? It is also important for us to know the student’s previous medical history and/or medical problems. We are here to assist you in any way that we can and do not wish to cause any further injury. Thank you so much for visiting with us. We hope to see you soon at our school.